Music - Makigami on 2, 3, 7, 9 & 13. Yamashita on 1, 10 & 12. Inoue on 4. Mitama on 5, 6. Inoue & Makigami on 8. "Proud Mary" is written by John Fogerty. Remastered edition released on March 21st 2010 from Bridge, Inc.
* Track 12 & 13 are added as bonus tracks on the 2010 reissue. In summer 1978, Makigami Koichi gathered his friends and produced an underground theatre performance entitled "Yochu No Kiki" ("The Crisis of Larvae" in English). Also, in the performance, Makigami used an instant-formed live ensemble called Hikashu for musical accompaniment instead of pre-recorded audio tape. The reaction was mixed. But they got some positive feedbacks on the music so they decided to try music. A band was born. At that time, the members lived together in a small house located at residential area of west Tokyo. After the first live performance at Kichijoji on August, they started composing and recording demo tape. The tape was distributed through word of mouth, and soon became popular among the connoisseurs through the grapevine. Radio DJ Mori Naoya came to the house and witnessed their rehearsals. Rock critic Agi Yuzuru contacted the band and offered to make an album on his indie label, Vanity. Nakamura Naoya, a manager of the popular rock cafe called Nylon 100%, frequently played the tape at his cafe. Also the band started to receive live offers, and they did many dates with other new-wave acts or the bands of the rock movement called "Tokyo Rockers". The 1978 album is a selection from those early demo tapes. Actually, they recorded many demos and forgot many details themselves. The booklet of the original release has an discussion of the original members over the album (reproduced in the 2010 reissue) and it revealed they no longer remember the details back then. For example, "Proud Mary" was performed by Mitama, Makigami and an unknown musician they don't remember exactly anymore. Also, at that time many people visited the house, took part in recording sessions and no one kept a log. So many things seem to be lost forever. However, it is certain that most things on the tapes were performed by the members themselves. And that's incredible. They are just a bunch of 23 years-old, never receive formal education on music. They were all self-taught musicians and started to play in public only a few years. In the case of the saxophonist Tobe Satoshi, he had been playing only for six months. Why the inexperienced musicians like them could make such wonderful songs and recordings? That's quite an mystery. But they had tons of interesting ideas and were strongly motivated by a desire to express themselves. That made the things so fruitful, I think. The performance quality of the tape is truly exceptional. That's why it was eventually released by Toshiba-EMI. Releasing an amateurishly-recorded 1978 reel-to-reel 4 track demo is out of the question for major labels back then. But it actually happened. I think that said it all. Then why took it so long? I think that the progress of the remastering technology made it possible. Major labels of Japan were usually very strict about sound quality. Speaking of quality of the sound, the 2010 reissue is *drastically* improved on its sound quality. I have never been an audiophile or such, but I could clearly say its sound is insanely great. You have to listen to it for yourself. By the way, the 2010 reissue has two bonus tracks. There is no information regarding them on the booklet but I assume they were recorded later than other tracks, presumably on April 1979. The big difference was using Roland CR-78 for rhythm pattern (hence the name "CR78 version"). The 1978 demo was recorded with Ace-Tone instead. You could see those 1979 recordings are more "polished" and more similar with the versions on the first album. Interesting evolution, I would say. 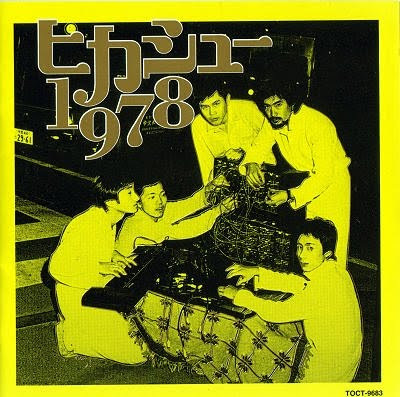 On december 1978, Makigami went to see Chikada Haruo, the musician and producer, and passed the demo. Next day, he received a call from Chikada. Chikada said he was deeply impressed with the tape and wanted to produce the band, if possible. The rest is history. On April 25th, Hikashu will perform at Airegin, a small jazz house in Yokohama. It is a 30+ minutes ride from central Tokyo by train, and seeing them in such a situation is truly a rare treat, so not to be missed. The capacity are strictly limited so the reservation is recommended. Call Airegin at 045-641-9191. Probably they don't understand English so ask your Japanese friends for help. I also added some live dates in Live Schedule page. Hikashu will tour the northern part of the Kyushu island on coming June. It's been quite a while since they hitted the island last time. Also, regarding in-print titles, I putted some links to HMV Japan (in English mode) in Discography page. mechanicoid commented on this blog that he buys Hikashu disc from them and I found their service is convenient for foreign audiences. Thanks mechanicoid. 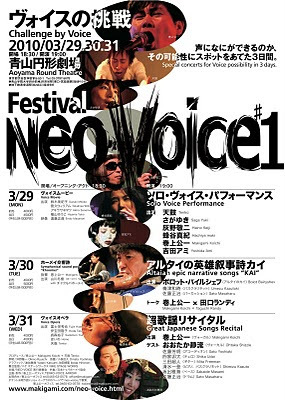 Makigami, along with voice performer Tenko, produces a music festival called "Festival Neo-Voice", which are held on March 29-31 2010 at Aoyama Round Theater, Tokyo. It is an ambitious undertaking indeed, even for Makigami. 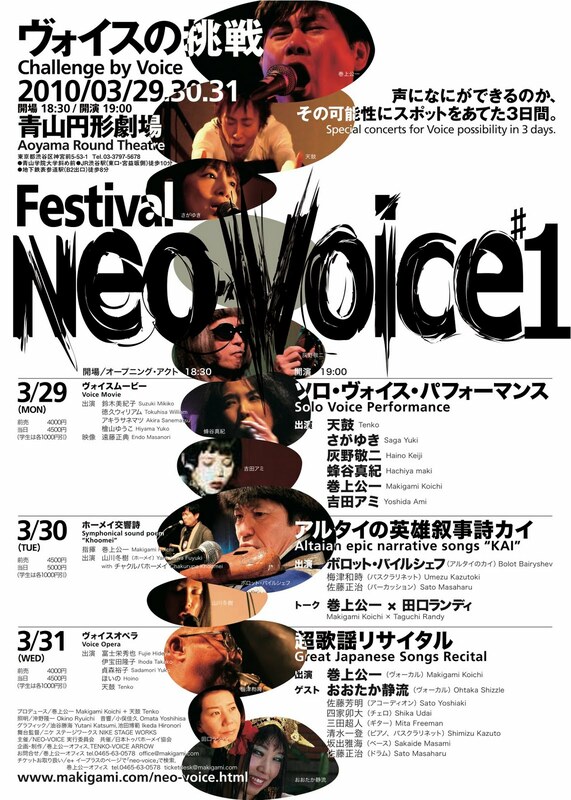 The festival focuses on the possibility of human voice expression. The day 1 is a series of unaccompanied solo acts of top voice performers from Japan. Also, Haino Keiji, the king of Japanese underground music, will perform a completely unaccompanied voice solo set. It is probably the first time for him and he has been active in music since late 1960s. The day 2 is devoted to Bolot Bairyshev, a popular singer from Altai Republic. He will sing Altaian epic narrative songs called Kai. And the day 3 is the great Japanese songbook concert of Makigami, with the augmented Hikashu. "Altaian Epic Narrative Songs "
"The Great Japanese Songs Recital"
This is surely not to be missed. It is the first performance for them this year. Since there was no opening act, the group threw quite a long show - nearly 2 1/2 hours. And it was splendid, too. First Mita appeared on stage, raised a hand to the audience and abruptly started solo improvisation on his guitar. Next Sakaide came along, and made some backing - just sporadically battered the music stand with some sticks. Then Sato started providing some rim shots. A collective improvisation followed and it gradually segued into "Skirt" from the "Mizu Ni Nagashite" album. That's how the band embarked on the main set of the day. After the first song, all the members started speaking simultaneously. It was not just a voice performance - each members spined meaningful sentences. But by doing it together it had an interesting effect. The simult speaking was used to be regular act for the band's performance but this was for the first time in a few years. Three composition from the "Ten Ten Ten" album were played: "Nikoseron," "Utorius" and "State of Doors". Nikoseron was played different than the last time - the performance on December 2009 at Shibuya Quattro was so fast and fierce throughout. This time it started in slightly slower tempo and more reserved. It was interesting alteration. As always, "Ikirukoto" became an extended performance. The band usually play it about 15 minutes, and this time, in the middle of the song, Makigami himself joked that he was often remarked they played it too long. And this one has interesting progressions. After the second verse, Sakaide suddenly started a repetition of a strong, single note. It gradually worked like a drone, and Sato responded it by playing a slow, simple pattern, then the band went into a collective improvisation. For live concert, Hikashu frequently picks up some lesser-known tunes every time. This time, the biggest surprise for me was "Sun Ra wa Pianist". It was also the last song of the main set. The unreleased composition is rarely played these days, and the arrangement was very different as I listened it last time. As an intro they played a long improvisation loosely based on the rhythm pattern of the song. Shimizu used a loungey, organ like sound so it was more like Sun Ra. In coda, the members chanted the main theme of the composition. It was like, they led us to the spaceway - then they left the stage. It was a nice way of closing the long concert. Next performance of the group is on May 28th, at Star Pine's Cafe. Makigami recently revealed that Hikashu will record the composition entitled "Sun Ra Wa Pianist" (Sun Ra is the Pianist) in near future for the next album. The composition was written by ex-member, the late Nomoto Kazuhiro and lyrics by Makigami. It has been played since early 1990s but remains unrecorded. It is a mid-tempo, jazzy tune (actually, some parts are in 4/4). 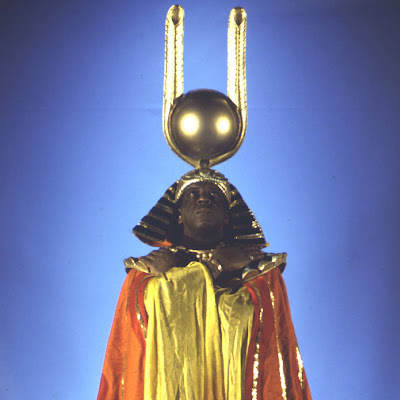 The lyrics is a homage to Sun Ra, avant-garde jazz pianist and leader of his big band, Arkestra. I heard the tune once in their concert, and it's so good that I'm glad they decided to record it at last. According to Makigami, the band is planning to record it with a jazz saxophonist Umezu Kazutoki, whom the band often collaborated with. The new album is still in works and Makigami said hopefully it will be released on May or June this year.